It would be easy to write off "Mr. Popper's Penguins" as "inoffensive, family fun," but there's just too much past history involved to let an incredibly poor update to a beloved children's book, not to mention the new low that Jim Carrey has sunk to by involving himself in the first place. 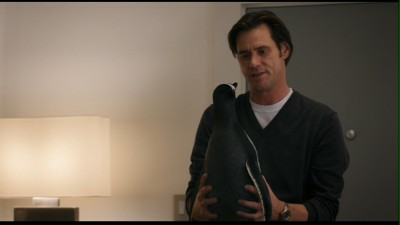 Directed by Mark Waters, "Mr. Popper's Penguins" features Carrey as Thomas Popper Jr., a workaholic realtor, who in a character development only those who've never seen a movie in 20 years couldn't see coming, is also a divorced, somewhat absentee father. Tasked at work with securing the purchase of Tavern on the Green for his straight-out-of-the-90s bosses (played by Dominic Chianese and Phillip Baker Hall), Popper's life is turned upside down by the arrival of a penguin and rather than realistically deal with the problem, Popper and his kids find themselves engaged in a wacky set of shenanigans as five more tuxedoed pieces of comic relief enter the picture. The premise of "Mr. Popper's Penguins" on its own is enough to make anyone with a taste for originality cringe. It's a tired concept that is slapped on an even more tired concept. 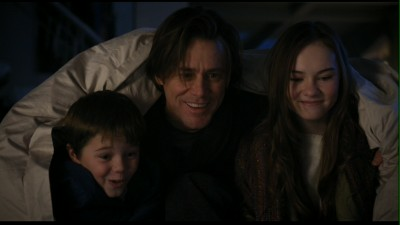 Within the first five minutes, Carrey is coasting, rehashing his "Liar, Liar" character with an added dose of likeability at the expense of all charisma. For a man who was once THE name in comedy, to see him sing in a pandering, dull children's film like this is hard to watch. Paired up with a group of penguins (real at times, admittedly decent CGI at others), his trademark slapstick is reduced to him sliding in water, reacting to being bitten and yes, the lowest of the low, poop jokes. What should be a story about realizing what's important in life is overshadowed until a final act about face for penguins who expel streams of CGI feces that is foul icing on a lazily made cake of disappointment. CGI shenanigans aside, the most criminal element contained within "Mr. Popper's Penguins" is Popper's plot to procure his previous partner (Carla Gugino sporting a very ugly hairdo) from the pending proposal (if alliteration like that tickles your fancy, a supporting character in the film has you covered; it's her only purpose) by her new beau. For a film aimed at a very young demographic, it's casual attitude toward divorce and introduction of the idea that an absentee father can change overnight and fix a broken marriage is an incredibly reckless storytelling decision. Quite honestly, the film trivializes marriage at a level that would make the Kim Kardashian marriage look scared. The change is precipitated by an entirely contrived character shift that makes me wonder if the film was cobbled together in part from a previous idea for a film. Add Clark Gregg to the mix as an "evil zookeeper" out to get the penguins and you have an entirely insufferable, waste of time. Fifteen years ago, "Mr. Popper's Penguins" might have been given a partial pass, because even then the plot points were growing thin; in 2011 such a film is entirely unacceptable and no parent should ever find oneself in a position where the only option for entertainment is this. There are far better animal films out there, there are far better films about divorce out there, and even the worst Pixar film is a milestone in filmmaking compared to this dreck. I truly feel sorry for Jim Carrey, who's a shadow of his former self; I'm sure though he took home a huge paycheck for one of the most dismal efforts in his career. In fact, I could have saved everyone the time of reading this and pointed out the fact that Ben Stiller originally turned down the role; that speaks volumes unto itself. The 1.85:1 anamorphic widescreen transfer's biggest issue is revolves around the inconsistent and infrequent use of DNR, that is notably present on Carrey's face. That aside, the transfer does a fine balance of presenting both warmly and coldly shot scenes. When the minor DNR issue is not present, detail is well above average. The Dolby Digital English 5.1 audio track really gets a chance to open up when the penguins engage in set piece shenanigans, notably in the middle of the film and at the end. Dialogue is prominent and distortion free, while the generic score is nicely dialed back as to not obscure effects or other more critical sound design elements. An English 5.1 Descriptive Video track is included as well as Spanish and French Dolby Surround tracks. English SHD and Spanish subtitles are included. First up for those wanting to know more about the production itself, there's a feature length commentary by Director Mark Waters, Editor Bruce Green, and Visual Effects Supervisor Richard Hollander. Two of your typical promotional style featurettes included "Ready for their Closeup" and "Ladies and Gentlemen." More of an interest towards kids are a collection of deleted scenes, a blooper reel, and the first two chapters of the original novel, narrated. The featured bonus though is the most worthless, "Nimrod and Stinky's Antarctic Adventure," which is on par with the animation of a sidebar flash ad on the Internet. It's mercifully short but as a whole lame and likely to disappoint young fans. Low-rent, tired storytelling married and pitiful characterization sum up "Mr. Popper's Penguins" to the letter. What few honest laughs it hides within are overshadowed by CGI penguins dancing, watching Chaplin films and pooping, not to mention the protagonist trying to fix his marriage by being completely irresponsible cements "Mr. Popper's Penguins" as a movie hopefully soon forgotten from the conscious of anyone who had the misfortune to even see a poster for it. Skip It.